See the original report and comments on Indymedia Ireland here. 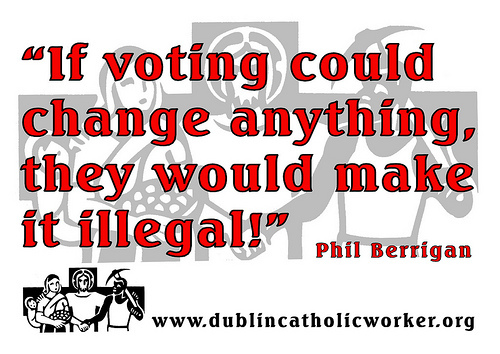 Irish Elections 2011: Ciaron O’Reilly Christian Anarchist (Catholic Worker/ Plowshares) Address to the Irish People! We sent Bradley Manning through Shannon Airport to war on Iraq. He is accused of exposing war crimes while in Iraq and is now being tortured in Quantico, Viriginia, USA. The last place Bradley was before stepping foot in a war zone, and probably a lifetime in prison, was Shannon Airport, Ireland. Let’s bring Bradley back to Ireland and offer him sanctuary and Irish citizenship! Grant Bradley Manning Irish citizenship. let’s demilitarise Shannon Airport! Most U.S. troops that went to invade and occupy Iraq went through the small departure lounge at Shannon Airport on the west coast of Ireland. Some departed to kill and be killed, some to be scarred for life with post traumatic stress. 4,000 returned in body bags, 10,000 with injuries they will never recover from and another 20,000 with injuries they should recover from. According to the Lancet Report, these young Americans killed over 1 million Iraqis (mostly women and children), we owe all these people an apology and to shutdown the U.S. military base at Shannon Airport! ……always choose the third! Think and act outside the box! With our consumer power let’s support ethical production. With our solidarity let’s support grassroots workers struggles to seize the means of production! Full report including comments on Indymedia Ireland.